This is a very desirable and highly collectable Carlton Ware figurine in the very popular 'Carlton Figurine Series '. In point of fact, this 'series' never saw the light of day and the drummer is one of the only few band members modelled. Even then, this was never put into production so there very few examples ever released. This one is a Large Toucan entitled, The Drummer and is a kimited edition colourway. 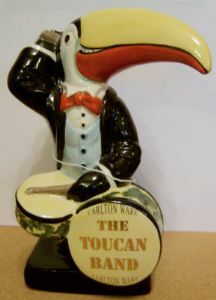 As stated above, he was to form part of 'The Toucan Band' but, as is often the case in real life within the music world, this band did not fully materialise. He is in perfect condition. The Toucan stands just over 7.25 inches (18 cms) tall.